All of this talk of festivals has got us buzzing, especially as we’re going to a fair few between us at Escentual HQ. This got us to thinking about the sorts of things that you can’t live without at a festival, and how often you leave something behind. To solve this problem, we’ve created a pair of kits to see you through the festival season: the Escentual Festival Essentials Kit for budget conscious festivallers, and the Escentual Luxe Fesitval Kit for those who are more glamping than camping. Each kit is designed to take the trouble out of packing for your weekend away, so you can literally grab, go and start enjoying yourself. The Escentual Festival Essentials Kit contains everything from Tigi Dry Shampoo to La Roche-Posay Suncream to keep you looking groomed. It also includes mints, ear plugs, plasters and all of those other niggly things that you forget to take with you. 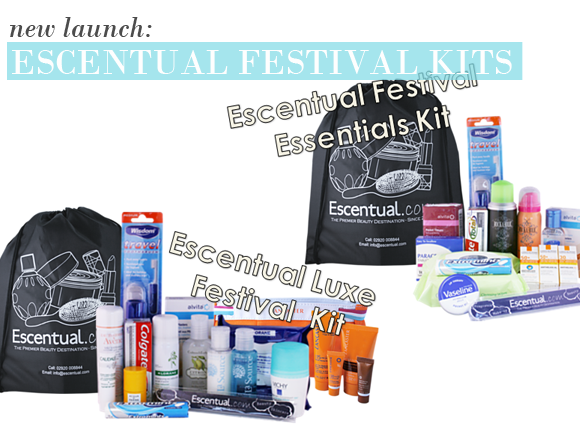 The Escentual Luxe Festival Kit includes a wealth of treasures alongside the essentials. From Crabtree & Evelyn Antibacterial Hand Cleanser to Avène Thermale Spring Water Spray, Caudalie Lip Conditioner to an Acqua di Parma Colonia Miniature, there’s plenty of luxury in the kit to keep you happy all weekend. With big savings on the original value of the products you’re grabbing a bargain, too! This entry was posted on Thursday, June 30th, 2011 at 8:22 am and is filed under Fragrance, Make-up, New products, Skincare, Sun and Tanning. You can follow any responses to this entry through the RSS 2.0 feed. You can skip to the end and leave a response. Pinging is currently not allowed. Congratulation ! Ordered June, 29. afternoon – parcel arrived July 1. morning. Perfect !